Rahmat Shah and Ishanullah Janat held off the Ireland bowlers to seal a historic maiden Test win for Afghanistan. Afghanistan vs Ireland One-Off Test: Afghanistan’s cricket team Monday recorded its maiden Test win as it beat Ireland by seven wickets in a one-off game in Dehra Dun, nine months after making its debut in the traditional format. Both Shah and Ihsanullah struck half centuries, helping their team march to the victory target on the fourth morning of the match in a place that has been its ‘home’ for a while. Shah scored a 122-ball 76, and Janat an unbeaten 129-ball 65 as Afghanistan notched up the target within a session. Afghanistan lost Shah and Mohammad Nabi back-to-back off James Cameron-Dow’s bowling before Hashmatullah Shahidi smashed the winning boundary to trigger celebrations in the Afghan dressing room. Also playing their second Test, Ireland were on the back foot from the opening day when they were bowled out for 172, even as Afghanistan secured a big first-innings lead after responding with 314. On the fourth morning, in sight of their maiden Test triumph, Shah hit consecutive fours in just the second over off Tim Murtagh, setting the tone for the innings. “Happy. It’s a historic day for Afghanistan, for our team and our people,” said Afghanistan captain Asghar Afghan. “We have been playing for a while, we have been playing first-class cricket, so we have that composure. The bowlers were very good, Rashid, Yamin. Now we’re going to South Africa for World Cup preparation. We will try out best to play good cricket.” Shah was named the Man of the Match for his twin fifties. “First of all I’d like to congratulate the country for this win. There was a difference in the pitches – the ODI wickets was suitable for a spin, this was better for batting. We played session by session and tried to win the match that way. 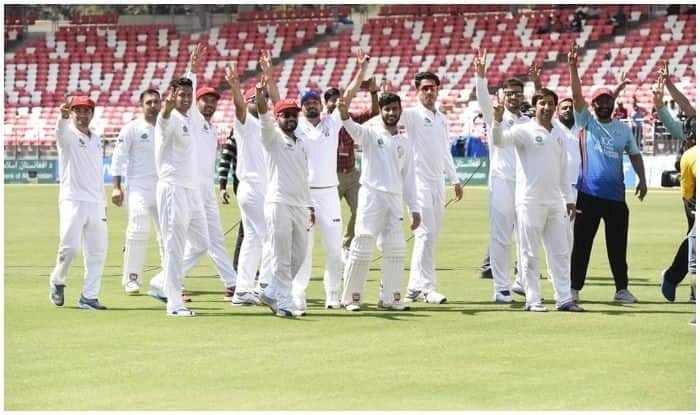 I would like to give credit to the bowlers, they played really well.” By matches, Afghanistan are joint second-fastest to a maiden Test-match win, alongside Pakistan and England. Afghanistan 314 (Rahmat 98, Asghar 67) and 149 for 3 (Rahmat 76, Ihsanullah 65 not out) beat Ireland 172 (Murtagh 54, Ahmadzai 3-41, Nabi 3-36) and 288 (Balbirnie 82, O’Brien 56, Rashid 5-82, Ahmadzai 3-52) by seven wickets.